OnisionSpeaks, or Speaks, is one of Greg's more popular YouTube channels. Greg uses his Speaks channel to preach his opinions and morals to his audience at first through a vlog format and later transitioning to a comedy/reaction format. Onision educates people on popular topics like trypophobia, yoga pants, emos, PewDiePie, cutting, thigh gap fads, anime, feet obsessions and countless other subjects. OnisionSpeaks has rapidly become one of the most popular Onision channels as of 2014, and aims to educate people on things they care about. We have a lot of fun here, for sure. 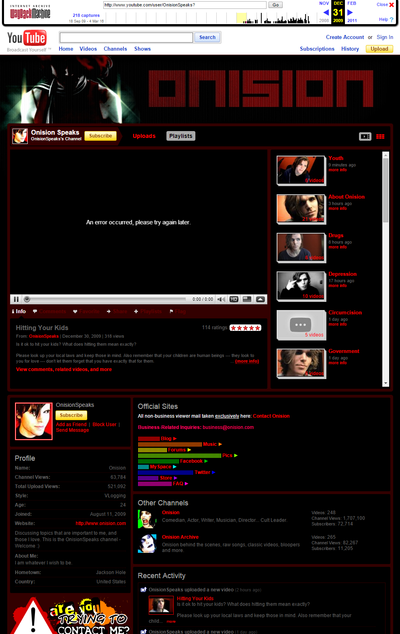 Greg created his Speaks channel on August 11, 2009. He would use the channel to give his opinions on serious topics in a vlog format. Many of these videos answered fan questions left for him on his Onision Website. Some would be fans asking for advice, while others would ask for his opinion on certain topics. The channel almost immediately began receiving negative feedback from fellow ranter/vloggers in the YouTube community after Greg began uploading extreme videos such as "Murder Eaters" and "Whale Attack". (Videos now removed) This sparked a long term negative relationship between the Youtube ranting/vlogging community and the Speaks channel that went on for years. After Greg's UhOhBro channel started to become popular after switching it from a gaming channel to a reaction channel, Greg decided to make the switch on his Speaks channel as well. He explains he decided to do this because his fans did not support the channel enough. (Source) In 2013, he uploaded both vlog and reaction videos, before completely committing to only reaction videos in 2014. This change seemed to have paid off as his channel began rapidly gaining subscribers and became his third channel to reach 1 million subscribers in May 2015. Although Speaks videos are now similar to his UhOhBro comedy image reaction videos, Greg maintains his "educational" Speaks style to the channel. Now he expresses his opinions and morals through jokes and reactions, as opposed to the serious vlog style. This page was last modified on 28 March 2017, at 13:38.